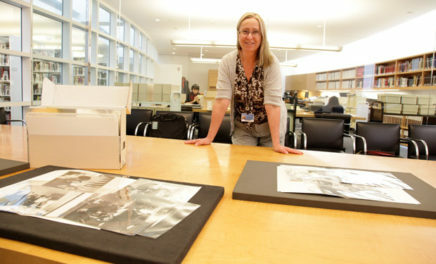 Three prints by James Ensor have just joined the collection of the Getty Research Institute. All three were made in the 1890s, when Ensor was at the peak of his creative powers, and all contain the eerie imagery for which Ensor is known (and loved)—skeletons, masks, and crowds. Two of the three take inspiration from stories by Edgar Allan Poe, another visionary genius with a talent for the macabre. In Hop-Frog, the print shown above, a group of bound men hang above a giant ballroom filled with spectators, while a skeleton has fallen into the empty circle below. Ensor imagined this scene from Poe’s short story “Hop-Frog,” in which a dwarf and court jester takes vengeance on his king, who had cruelly mistreated his lover. Hop-Frog raises himself and the chained men—the king and his council—on the end of a chandelier rig then proceeds to ignite them and escape to the roof. Ensor imagines the scene with a dramatic perspective that reduces the crowd to a sea of tiny figures stretching back as far as the eye can see. 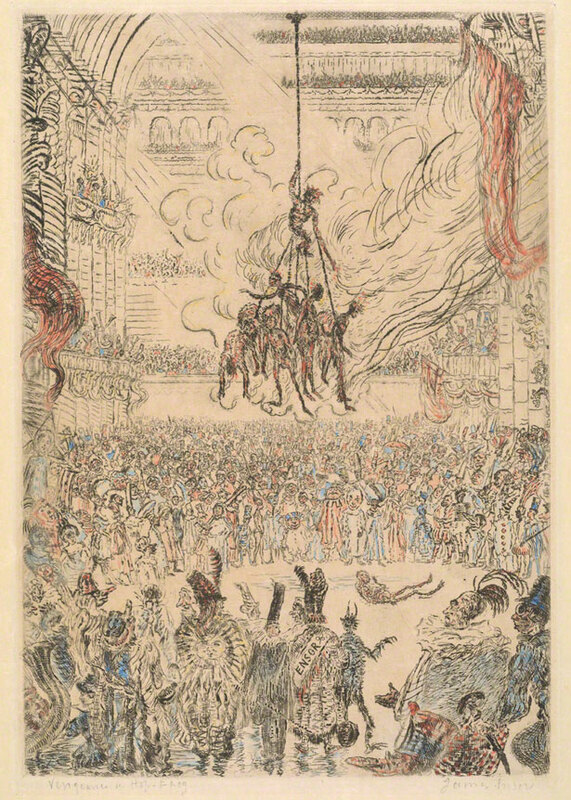 Colored wash enhances the riotous scene, as with many of Ensor’s etchings. Also inspired by Poe this print based on “King Pest,” about two sailors who stumble into an undertaker’s shop in a plague-riddled area of London. We see the terrifying “King Pest the First” and his ghoulish counselors hold a mysterious meeting around a table bearing a steaming cauldron, knives and forks in hand. Above, a skeleton chandelier with a glowing eye socket hangs from the ceiling, adding to the macabre mood. 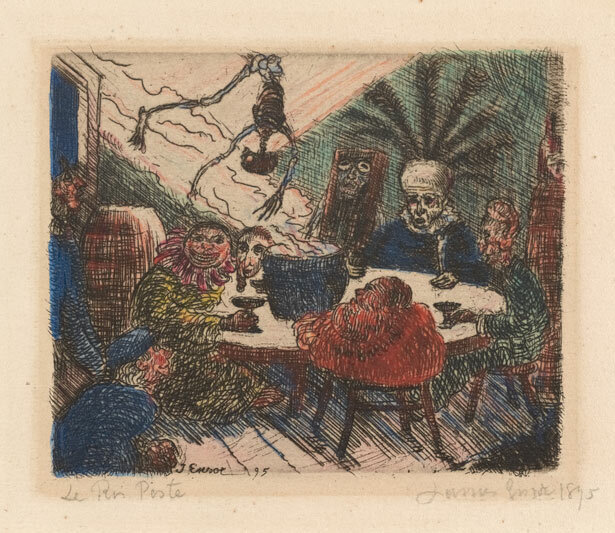 These deliciously disturbing prints join the GRI’s already significant collections on Ensor, which include more than 100 autographed letters and many prints. And the Getty Museum houses Ensor’s masterpiece Christ’s Entry into Brussels in 1889, making the Getty an important repository for the artist – a key factor in the collector’s decision to generously give these prints to the Getty. In fact, in 2014 the Museum will mount a major exhibition devoted to Ensor, which will include the painting and prints from the GRI, along with numerous loans. Welcome to Alfred Schmela’s Art Gallery!